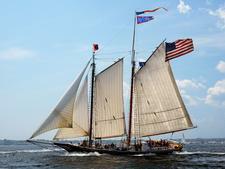 Launched in April 1871, the Lewis R. French is the oldest commercial sailing vessel in the U.S. and is a National Historic Landmark. 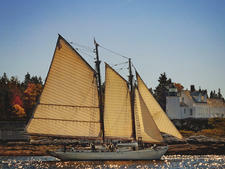 Three brothers built the Lewis R. French in Maine in 1871, naming it after their father. The French, as the ship is known, enjoyed a 100-year career as a cargo ship, carrying everything from bricks, lumber and firewood to granite, lime, sardines and Christmas trees. She was extensively rebuilt in the 1970s for the passenger trade, adding guest cabins, a cozy galley and USCG safety requirements. The ship's current owners, Captains Garth Wells and Jenny Tobin, grew up sailing. 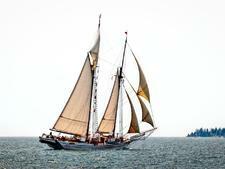 After many years serving on tall ships, Garth bought the French in 2004. 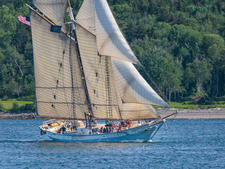 He met Jenny while she was serving as a first mate on another windjammer. The two married in 2007. One or both serve as hosts and guides during cruises. 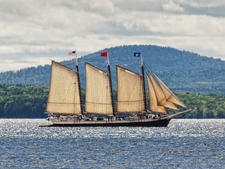 A two-masted schooner with four lower sails and two topsails, the French has no inboard engine, meaning "wind, tide and mood" help create the itinerary. Each trip is unique and the captain strives to take guests to anchorages off the beaten path. The ship's shallow draft allows it to anchor in small harbors where bigger ships can't go. The crew puts an emphasis on "unplugging" and asks that no cellphone calls be made on ship, though silent technology is welcome. Most passengers find they enjoy leaving that "other world" behind. 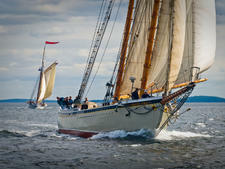 The crew also emphasizes participation for those who want to take an active role in learning to sail a schooner. The French's sailing season starts Memorial Day weekend and ends the first week of October, with cruises ranging from three to six nights. While trips have no set itinerary, some offer special events, such as kayaking opportunities and music festivals. 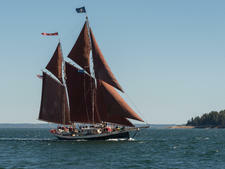 The ship sails round trip from Camden, Maine, and cruises the islands between Boothbay Harbor and Bar Harbor. The French carries along a yawl boat -- a push boat with a diesel engine named "Greyhound" -- to assist should the wind die. The French carries 21 passengers and sets the minimum age at 16. The ship has six double bed cabins, two bunk bed cabins and five single cabins. (Some bunks are extra long to accommodate tall sailors.) There is no single supplement. Each cabin is small, but comfortable, with a sink and towels, a window that opens, readings lights and a bed with linens and blankets. There are also nooks and hooks to stow gear. Passengers can bring sleeping bags and sleep on deck during comfortable weather. There are two bathrooms on deck. One bathroom has a hot freshwater shower. The ship has limited 110 volt AC power that can be used for medical machines or battery charging. The crew prepares three full meals each day as well as early riser dining options and snacks and fruit throughout the day. Meals are served either buffet style on deck or family style in the galley depending on the weather. An average day could begin at 6:30 with coffee and muffins on deck then segue to full breakfast at 8 a.m. with local delicacies including Maine blueberry pancakes and Maine maple syrup. Lunch may feature a soup, salad and homemade bread while dinner might include coriander pork tenderloin with garlic mashed potatoes, roasted asparagus and freshly baked bread. Fresh ice cream is cranked once a trip. The ship can accommodate special diets, and always offers plenty of healthy (and unhealthy!) options. Every trip includes an all-you-can-eat lobster bake and bonfire on a private beach. Burgers, corn and sides are also provided. Passengers can also hike the beach, play horseshoes or go swimming during that time. The ship provides nonalcoholic drinks. Passengers can bring their own beer, wine or spirits to store in an onboard icebox. The Lewis R. French is a non-smoking vessel.